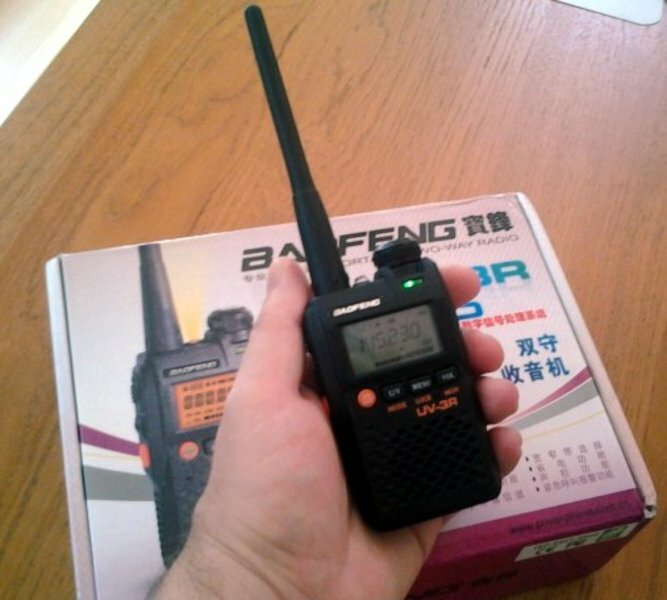 I bought a tiny dual-band HT from Baofeng UV-3R from Mega409shop on EBay for an amazing price, $49, including shipping. It has a few of problems that need correcting, and I was able to correct one of them. The volume is too high at the lowest setting, and should have a better range. The Low Power setting isn't useful. And the low-pass filter is inadequate on the 2M band, and depends on the antenna to filter out the second harmonic. 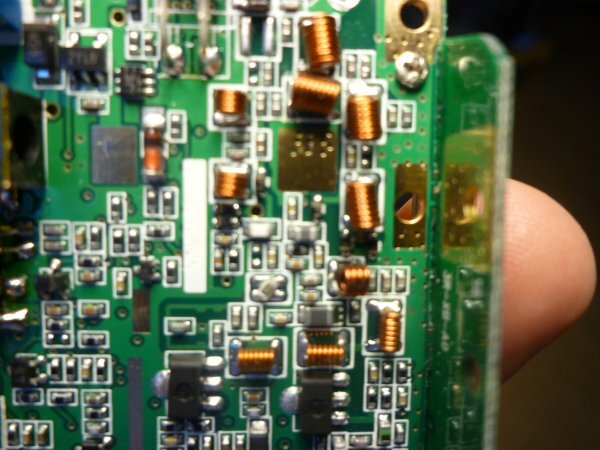 This page describes a fix to the Low Pass Filter that provides more filtering of the second harmonic of 144-148 MHz. I modified my Baofeng UV-3R 2m/70cm HT to have additional filtering, as first described by Clint KA7OEI and Andy G0FTD. I used a 33pf SMT capacitor size 0805. That size is too big to fit in the original intended spot, but if fits nicely between the coil and case ground pad, and has less inductance than the leaded part others have used in this location. 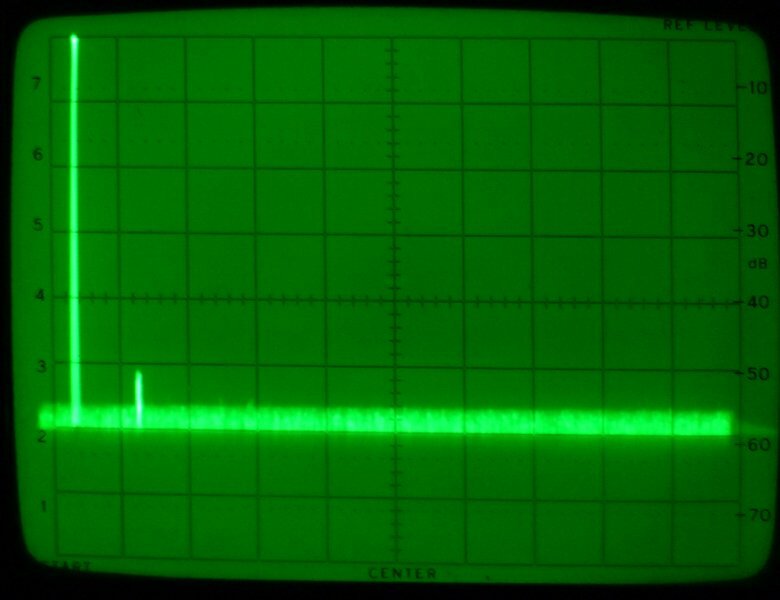 I don't have any spectrum analyzer photos from before the mod, but before the mod, the second harmonic from 144 MHz was only 20-22dB below the fundamental, when measured directly coupled through a 70dB attenuator. 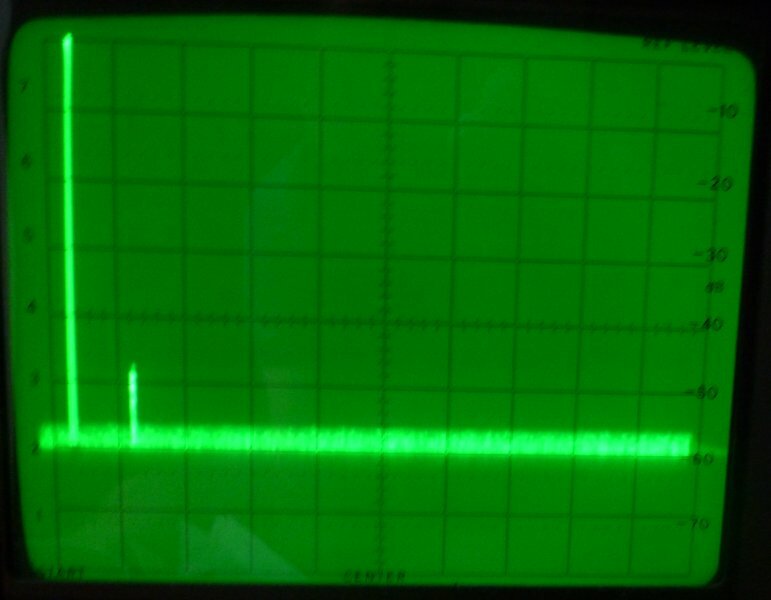 However, when transmitted the supplied VHF antenna and received, the 2nd harmonic was not visible above the noise floor, so it was down at least 56dB through the antenna. 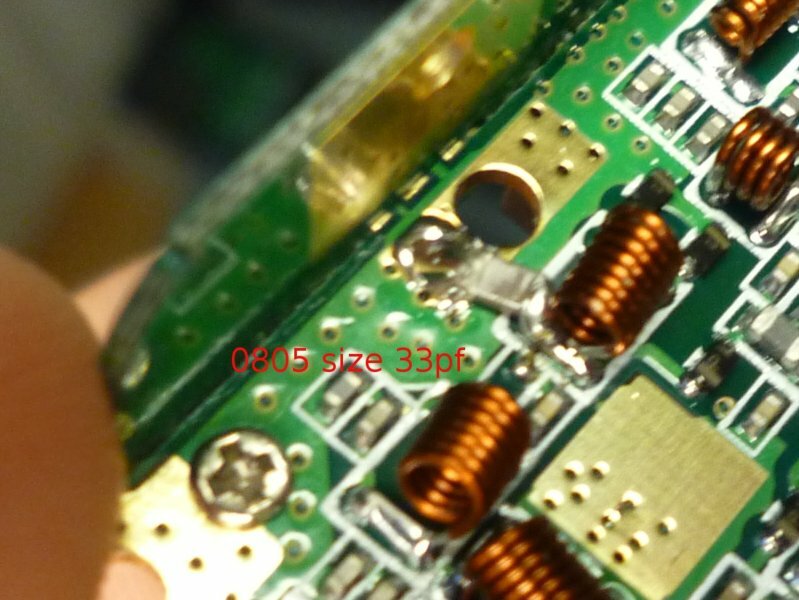 You can see the 0805 size 33pF capacitor. It's a challenge to heat the ground plane enough to solder the small part so I wound up using a through-hole tip for that end. For the coil end, I used a hook-shaped SMT tip. The 2nd harmonic is down about 48 dB from near 144MHz. The 2nd harmonic is down about 52 dB from near 148MHz. After the modification, I get 2.2W out on 144 MHz and 1.8W out on 446 MHz measured with a Yaesu YS-500 into a good VHF/UHF dummy load. In absolute terms, the second harmonic is 14μW to 35μW. On low power, I get 1W on 446 MHz, but I couldn't accurately measure the VHF low power with my watt meter. On VHF, post-mod, it seemed that the 2nd harmonic got stronger by about 6dB (in absolute power) when going from High to Low power. KA7OEI says he expected this modification to help there too, but I didn't measure it before. Given the odd behavior of low power on both VHF and UHF, I don't think it should be used, at least not in its current state.